Home » Electric Cookers » Rice Cookers » What is the Best Rice Cooker in 2018? What is the Best Rice Cooker in 2018? Many people are looking to get healthier with their diet, and rice is a known health food that many people are turning to for its benefits. You could also be a rice fan or are gluten intolerant. Cooking rice can be done for large groups of people most effectively through the use of rice cookers. Cooking it on a stovetop is fine too, but inconvenient, as you have to watch it and time it right. An electric rice cooker is designed to specifically cook rice (in most cases), with different settings for various rice types. You will need to have the right equipment for the job, so you’ll need to ask what is the best rice cooker to buy. There are several cookers in every price range and you will have a choice for something you can afford and love here. There are a lot of top rated rice cookers on the market available today, and some of them are very popular choices. While some appliances can only cook rice and maybe do some slow cooking as well, a few models even pressure cook, brown or sauté foods using a variety of different methods. If you’re a relative newbie with rice, here are some things to know about cooking it: 1 cup of uncooked rice yields about 1.5-2 cups of cooked rice and cooker capacity generally indicates how many cups of raw rice it can do unless otherwise specified. A small cooker typically manages 3-4 cups, while a large one can do 8-10. The next thing to know is about the machines themselves. The cheapest ones are manual, with a simple flip switch to turn it on and when the rice is done or water evaporates, it automatically turns off. The next type is a digital “cook and keep warm” and is good for cooking rice a few minutes before hand. There is more control over the process too. The final and most expensive are fuzzy logic machines that have more settings, including a delayed timer so you can come back from work to find it ready to be eaten! Some cookers can cook all types of rice – white, brown and sushi, and some let you make soups, stews and even cakes. Check the inner pot in all – some are non-stick, which makes clean up easy, but the others are safer for long term use. Check to see if you can use it to reheat or if you can adjust cooking time and if you have to soak rice before hand. See if there are special safety features, like auto-trip. If you usually cook brown rice, get one of these that does that specific job well. This guide is going to show you several of the more popular and well-made rice cookers that are available on the market today. Look for what is best for your needs, and compare. The Instant Pot comes in several models, but the best is this 6 quart model with 1000 watts of power that utilizes the latest in third-generation technology with a microprocessor that adjusts cooking time and intensity based on the inner pressure and temperature (a vast improvement over old technologies). The Instant Pot IP-DUO60 is highly versatile; you can do many things with it such as use the unit as a rice cooker, pressure cooker, or slow cooker. It also sautes, browns, warms, reheats, steams, and even makes yogurt. You may want to spend extra time learning how to use the 14-mode programmable interface as there is a learning curve involved in its use. When using it for slow cooking or sautéing, you can choose from 3 temperature settings, while pressure cooking can be done at one of two settings. When the cooking is over, it switches automatically to keep warm. You can even set a delay timer for up to 24 hrs if you want your food to be done at a specific time. The Instant Pot is said to be extremely safe with 10 mechanisms, like a safety lid lock, leak detection, pressure regulating, and an anti-blocking vent. It is easy to clean up as the 3-ply stainless steel cooking pot is dishwasher safe and so is the steel steam rack. The model is known for quick cook times and energy efficiency. The exterior is fabricated with more stainless steel and plastic. The favorable reviews have indicated that there had been very few complaints overall. As you can see, this is really a multipurpose cooker that has rice cooking as one of its functions. If you’re looking for similar appliances that are great pressure cookers, we reviewed a few earlier. While the Instant Pot above is a fabulous appliance, it does cost a bit. If you’re looking for the best rice cooker under $50, consider the Aroma 8-Cup Cooker. It is the perfect rice cooker for a family and can do a bunch of other things well too. 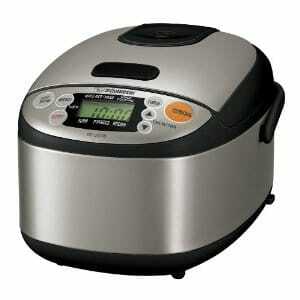 It has an 8-cup capacity (cooked rice) and is extremely easy to use, with simple one-touch programming. It has separate functions for cooking both brown rice and white rice and there is an automatic keep warm setting. It also functions as a steamer for meat and veggies that lie on a top removable tray with rice below, and comes with a spatula and measuring cup. You can use it for making stews, soups and a host of other dishes. You can set a delay timer for up to 15 hours. This means you can have a whole meal done in one pot by the time you get home from work! Featuring a removable Teflon coated aluminium inner pot, it is very easy to clean. However, this means you have to be careful not to scratch the surface or the Teflon will leach into the food. The top lid is slightly tougher to cook as it is hinged and not removable like a traditional glass lid. Overall, users say both white and brown rice turn out perfectly if you follow the instruction manual to the T.
The Panasonic SR-3NA is perfect for a family of three. It comes with a simple one-touch lever button to start cooking. It cooks rice until it is perfectly done and is equipped with an automatic shut off. A red indicator light lets you know when it’s on. This model of rice cooker features a stay-cool tempered lid that is see-through so you don’t have to interrupt the cooking of the rice to watch how it’s doing. It also helps keep the rice warm for a while. The pot is non-stick coated aluminium, and along with the lid is dishwasher safe. The cooker has handles that allow you to safely transport the unit. Also included are a rice scoop and measuring cup. The rice has to be washed in a separate pan first before adding it to the pot along with fresh water. Even though it is not recommended that you cook brown rice with this unit, users have said that you can if you just add a little more water than you would for white rice. Sushi and wild rice and even oats can also be cooked in it. The only complaint some people have is that for the capacity, it is slightly more expensive than similar brands but its performance is so good that it’s worth it. From the best rice cooker brand comes the Zojirushi Micom 3-Cup Rice Cooker and Warmer. It is a stainless steel rice cooker will cook up to 6 cups of cooked rice at a time, enough for at least 4 people. It features an easy to read and use control panel. You can use it to reheat the rice and has a keep warm function. A delay timer with two settings is useful for having the rice ready at any later time. You can choose between a melody or a beep to alert you when the cooking cycle is over. It has cooking functions for white, wild, brown and sushi rice, porridge and quick cooking and operates by micro-computerized fuzzy logic technology. You can even cook quinoa and polenta! It comes with a non-stick coated spherical inner pot for even heating that features measuring lines on the inside. This and the detachable inner lid are easily washable. The exterior is easy to clean with a stainless steel surface. It also features a retractable power cord. Included accessories are a non-stick rice spatula and holder and a measuring cup. It is compact, sleek and modern looking. It is a favorite among serious rice eaters and there were no negative reviews overall that could be found. Reported to be easy to operate and takes up a small amount of space. The inner pot’s non-stick coating is very tough and long lasting. If you’re looking for the best rice cooker under $100, this Tiger Corporation Micom Rice Cooker is the one. It can cook up to 5.5 cups of raw rice. With it you will be able to cook both your main dish and your rice simultaneously, as it comes with a “tacook plate”. It has four main cooking settings for white rice, brown rice, slow cooking/steaming and synchrony cooking. You press any of these to turn it on. It also has an Off/Cancel button and a Keep Warm button. It also comes with a nonstick spatula, a measuring cup, and a cookbook. It has dual cooking timers and a nonstick coated pan. The Automatic Cooking Logic system continually monitors cooking temperature to create the perfect meal. The syncho-plate does not allow juices from the top vegetable or meat layer to fall into the rice at the bottom. However, this plate can only hold enough for 2-3 people, unlike the rice pan.